Consumers are exposed to 10,000 brand messages every day. With that many brand messages, it’s hard to get your business to stand out. But one of the best tried and true methods are printed banners. Banners can easily share your message without being pushy or obtrusive, like many digital brand messages today. Banners help promote your business, whether it’s at your storefront or at a trade show. If you want to know how to make a banner online, here’s an easy guide. Banners are an important aspect of your marketing campaign to help build brand awareness. The first step toward creating your business banner is to choose the right banner type for your need. There are found main banner types you should be aware of. Feather banners or teardrop banners can range from 10 to 18 feet tall. They get their name based on their unusual shape, which mimics a feather. Choose from a stand-alone base or in-ground mounting for your feather banner. The banners are typically printed on nylon and can be frequently switched out to promote new messages. Pop-up retractable banners are great for a less permanent banner option. These generally range from 33 to 57 inches. These banners are designed to be lightweight and portable while remaining durable. They are easy to pop-up when in location to make a large impact. But when they are no longer needed, they take up minimum storage space. Trade show banners work best for attracting customers to a display booth. They are available in many sizes and material options to fit any need. These banners make a lasting impression on your customers with their bright colors and professional printing. They help guarantee that your booth won’t get lost in a crowd. Step and repeat banners are the perfect option for your press-covered events. These banners come in many sizes and are available in vinyl or fabric. Most commonly seen during press conferences or award shows, these banners ensure that your business logo will appear in every press photo or video from the event. They provide no glare so you don’t need to worry about photo flash ruining your event coverage. The next step for how to make banners is to decide on your banner size. The banner-type that you choose will determine what size options you have. Once you’ve chosen your type, take note of the banner sizes available. Use a measuring tape to help you envision the possible sizes of the banner. It’s always best to do this in the location where the banner will be displayed if possible. Remember to keep in mind visibility when deciding on your banner size. While larger banners cost more, they also make a larger impression on your clients. After deciding on a size, continue to make a banner by choosing your design. Looking for design inspiration? Check out this article for smart banner design ideas. And if you’re not artistically gifted, don’t worry. Many companies, like AZ Banners, can provide help with layout and artwork for a small fee. Now that you’ve chosen your banner type, size, and design, it’s time to submit your order! Make sure you include in your order the date you need the banner by. This way, if you are promoting a time-sensitive message or using it at a specific event, you know your banner will be ready. Once your order comes in, put it in place and wait for the results! Make sure you choose a high-visibility area with the most foot traffic. Now that you know how to make a banner, its time to create yours. To get started, just choose the type and size of a banner that will work best for your needs. Then create your design or consult with a banner company for them to help you with your design. From there, you just need to submit your order and wait for your business banner to come in! Request a quote from AZ Banners today and easily spread your message. 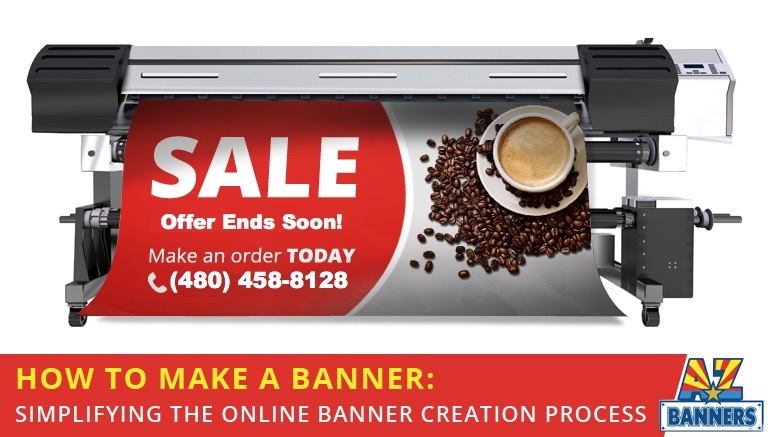 Are you looking for a quick and painless way to create stunning banners for your business? AZ Banners offers fast online banner printing solutions to help you get noticed. Get in touch with us today to learn how we can help! Request a quote online or call 480-458-8128!